iOptron brings together their unique compact "Level and Go" mount with the portable yet incredibly stable support system to create the AZ Mount Pro GoTo Alt-Az Mount with Tri-Pier and Case. 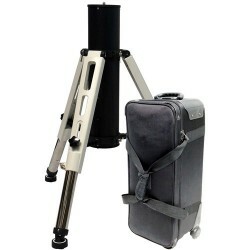 This combination of mount and support system is an ideal solution for users with mid-sized OTAs that require solid and reliable platforms for observing small or dim objects, or longer-exposure astrophotography. To safely store and carry the tri-pier, iOptron includes a rolling carrying case for it. Also included, are a 10 lb counterweight and star knobs with center post. iOptron's AZ Mount Pro Head combines multiple technologies to produce a mount that requires minimal input from the user while providing full GoTo capabilities. This technology is referred to as "Level and Go" by iOptron because that's about all you need to do. Using its built-in level indicator, you simply level the mount and turn on the power. Utilizing the on-board 32-channel GPS receiver and built-in position and angular detection sensors, the mount calculates its global position as well as the telescope orientation then automatically slews to an easily identifiable bright object in the night sky. All you need to do is confirm a bright object is in the center of the view, to activate tracking and GoTo functionality. Included with the mount is the Go2Nova 8407 computer controller. This handheld unit features a 212,000 object database with 60 user-defined customizable objects for your favorite celestial bodies. The easy-to-use menu-driven system displays on a 8-line 21-character back-lit screen. This fully GoTo-capable unit has automatic tracking for fast moving near-space objects such as the Moon and planets, and slower moving deep-sky objects like nebulae and galaxies. For set-up or manual use it has nine slew speeds starting at 1x and topping out at 10°/sec. The Go2Nova controller is powered by the mount to make use easier and simple while reducing the unit's weight. For increased functionality, the mount is also equipped with a Wi-Fi module for wireless connectivity to smartphones, tablets, and computers. iOptron combined the strength and stability of a pier, with the portability and leveling flexibility of a tripod to produce their Tri-Pier; offered here with white legs and a black center column. Designed to provide a rock-solid platform for their GoTo mounts, the pier and leg tops are made of lightweight and durable aluminum, with stainless steel leg extensions. The Tri-Pier's feet have built-in vibration-suspension pads for increased stability and visual clarity. It has a payload capacity of 220 pounds to handle even the largest OTAs and accessories, with an adjustable height from 31.5 to 42.5" and an uneven ground range of 3.35" (8.5cm). It folds up into a relatively compact 26 x 12.8" package, and the legs store inside the pier. To safely store and transport the TriPier, iOptron provides a wheeled carrying case. This piece of luggage features sturdy nylon wheels on one end with a hinged molded handle on the opposite end, and dual side carrying straps. Its top-loading lid has a zipper that opens three sides to allow it to open all the way and fold down out of the way. The areas around the wheels and pull handle are reinforced for durability and long life. iOptron provides these Star Knobs with Center Post accessories to level and mount your AZ Mount Pro, MiniTower, MiniTower II, or MiniTower Pro onto a Tri-Pier, Pier, or MiniPier.